Draper Storm Force 18v Li.Ion Cordless Drill with 2 Batteries - A formidable 18V combi-drill powered by 1.5Ah Li-ion battery. 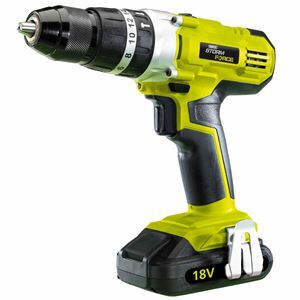 The drill contains a mass of innovative features, including a high-powered 2-speed motor with 16 torque settings and an integrated work light. These features coupled with its light 1.7kgs construction and soft-grip handle provide a comfortable unit to use. Each drill is supplied with two 1.5Ah Li-ion batteries; a one-hour quick charger and a heavy duty carry case. A superior quality cordless drill delivering the power and endurance essential for a host of professional trades. 19 high speed steel, straight shank drill bits with a cobalt finish, encased in a heavy duty steel storage box. 1, 1.5, 2, 2.5, 3, 3.5, 4, 4.5, 5, 5.5, 6, 6.5, 7, 7.5, 8, 8.5, 9, 9.5 and 10. Draper 13 Piece Screwdriver Insert Bit Set with Holder - 25mm 1/4" bits manufactured from hardened and tempered, S2 steel, which is applied with a satin chrome finish. Each screwdriver bit is attached with a plastic coloured ring for easy identification. Supplied in a convenient storage case, which opens up for easy access to the bits. Bit holder has a quick release collet, which allows bits to be expelled quickly and efficiently.